Read Jon's latest bestselling book and discover the proven principles and practices that make great leaders great! Leadership is all about seeing and creating a brighter and better future. It's about inventing, innovating, creating, building, improving, and transforming education, healthcare, business, government, technology, and every aspect of our lives and the world we live in. Some scoff when leaders share bold ideas, imaginative goals, and seemingly impossible dreams, but ideas, imagination, and dreams are the fabric positive leaders weave together to create the future and change the world. At one time, Star Wars was just an idea in the mind of George Lucas, but now the Force is as strong as ever. J.K. Rowling had a vision of Harry Potter and now he's an iconic part of our society - and as real as a roller-coaster in Universal Studios. John F. Kennedy had a vision for sending a man to the moon. Ronald Reagan saw the Berlin Wall come down before it crumbled. Steve Jobs imagined the iPod and iPhone long before the world was addicted to them. Abraham Lincoln envisioned a united America. Martin Luther King, Jr., had a dream about equality. As someone who has had the opportunity to work with many Fortune 500 companies, businesses, professional and college sports teams, hospitals, schools, and nonprofits, I've met many amazing positive leaders and have witnessed firsthand the power of positive leadership. I've seen how they have led, inspired, and transformed their teams and organizations. I've observed the impact they have had and the results they have achieved. I've also researched many positive leaders throughout history and learned about their paths to success. A positive leader sees what's possible and then takes the next steps to rally and unite people to create it. Every invention, project, creation, and transformation starts with an idea, an imagination, and a vision of what’s possible. History shows us that if you can see it, you can create it. If you have a vision, then you also have the power to make it happen. Positive leaders tap into the power of a vision and find a way forward. But in order to rally people to follow you, you must be able to articulate and communicate your vision in a simple, clear, bold, and compelling way. The vision a positive leader creates and shares serves as a North Star that points and moves everyone in an organization in the right direction. The leader must continually point to this North Star and remind everyone that this is where we are going. Yes, we were here yesterday. Yes, this is what happened in the past. But this is where we are going now. We don’t have a perfect set of plans because the world is always changing, but we do have a North Star that will guide us. We don’t have a perfect road map, but we have a path forward and we have each other. Let’s keep our eyes on the North Star and keep moving forward. Sharing a vision and a North Star is important because everyone needs one. Everyone needs something to hope for and work toward. As humans, we have an innate desire to be great and do something great. We have a longing to improve and create a brighter and better future and, yet, so often fear holds us back. As a positive leader you will want to carry a telescope and a microscope with you on your journey. The telescope helps you and your team keep your eyes on your vision, North Star, and big picture. The microscope helps you zoom-focus on the things you must do in the short term to realize the vision in your telescope. If you have only a telescope, then you’ll be thinking about your vision all the time and dreaming about the future but not taking the necessary steps to realize it. If you have only a microscope, then you’ll be working hard every day but setbacks and challenges will likely frustrate and discourage you because you’ll lose sight of the big picture. You need to frequently pull out your telescope to remind yourself and your team where you are going, and you’ll need to look through your microscope daily in order to focus on what matters most and follow through on your commitments. Together they will help you take your team and organization where you want to go. To understand the importance of keeping your vision alive, let's look at marathon runners. The fewest number of people quit a marathon in the first mile. And the second fewest runners quit in the last mile. I would expect a lot to quit in the last mile because, by that point, they have been running the longest and should be the most physically tired. But they don’t quit because they are so close to the finish line. They don’t quit because they can see the end in sight. They have a vision of where they are going and they keep running towards it. It shows the power of the mind and vision. The body should give up but it doesn’t because the mind sees the finish line. The most people quit a marathon in the 20th mile. That is where they are physically tired and mentally drained. They have run far and still have a long way to go. They lose their vision and so they give up. When I speak to companies, schools, and organizations, I encourage the participants to write down when they experience their 20th mile. We all have a 20th mile. Then, I encourage them to write down the words "Keep your vision alive" because if you keep your vision alive, you won’t stop. You won’t give up. Like Dabo you’ll keep moving forward and inspiring your team along the way. One of the simple ways to transform ideas and visions into results is to have a conversation with the people you lead. During each conversation, you should share the vision and ask each person to identify what it means to him or her. For the vision to come to life, it must have meaning to us individually. After the people on your team identify what the vision means to them, ask them what their personal vision is and how it can help contribute to the bigger vision of the organization. Then ask them how you can help them on their journey. What do they need from you to be their best? Finally, ask them how they would like you to hold them accountable. If you have an open and honest conversation like this with each person you lead and continue to communicate and discuss their personal and organizational visions throughout the year, you’ll see the power of a vision come to life. When people know how they are contributing to a bigger vision and have a bigger purpose at work - and feel like their manager-leader-coach genuinely cares about them - the research shows that engagement soars. I love learning and talking about the power of a vision because it's a vision that has driven me to overcome all the obstacles I have faced to do the work I do now. I've experienced the power of a vision in my own life and I know what is possible when you see it and act on it. If you look inside yourself and look out into the world you too will know that you possess the greatest power in the universe: the power to see a positive future and create it. 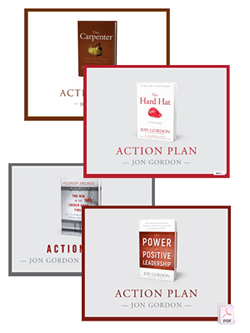 Utilize our downloadable Action Plans to help you take the principles from Jon Gordon's books and turn them into actions and results! Each action plan is an interactive workbook that can be used as an individual, with a group or team.